Sometimes in remodeling one thing just leads to another. Such was the case when Jim and Debbie Patrizi went to remodel their master bathroom in Martinez California. 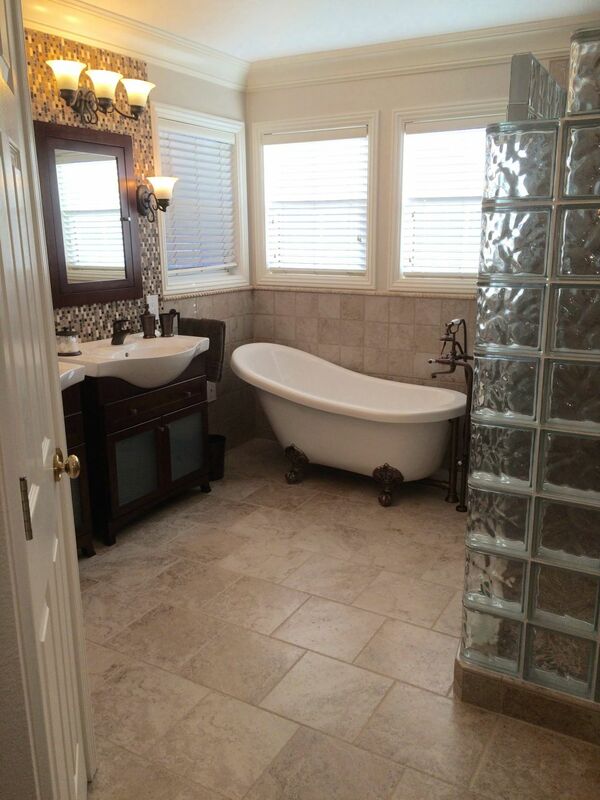 Learn 5 tips Jim and Debbie used to escape the common boxy look of their tract home bathroom to create a new relaxing, functional and gracefully elegant new design. Tip 1 – Eliminate squares and rectangles, think curves – A square 3’ x 3’ shower, a rectangular 60” x 32” bathtub – everything was so boxy in the old bathroom. Jim and Debbie introduced multiple curves into the new design. 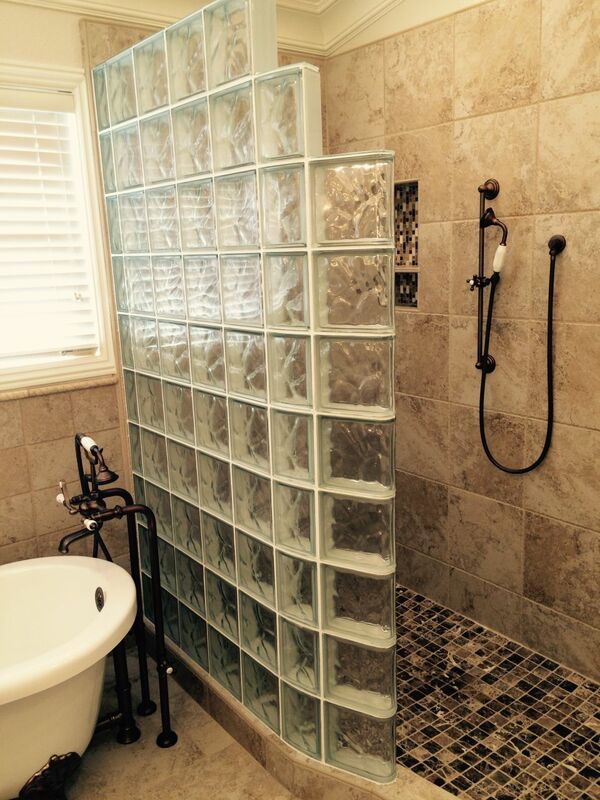 The glass block walk in shower uses a curved design. The freestanding tub has nice rounded edges. The sinks and vanity tops are also curved and have multiple heights to add interest. Tip 2 – Be ready for a little construction improv – As Roseann Rosannadanna used to say on Saturday Night Live, “It’s always something.” Isn’t that true when it comes to remodeling? Whether you are a DIY’er or a professional remodeler (like my company) you will come into technical job issues which will make you scratch your head a bit to find a solution. Jim’s challenge was a drain pipe which was sticking out of the floor. This pipe would be tough to move because of the direction of the floor joists. The improvisational solution was to use a custom waterproofed ready for tile base which was notched out where the pipe sticks up. Hand held shower – This product makes it easier for anyone to use the shower….and to clean it as well. 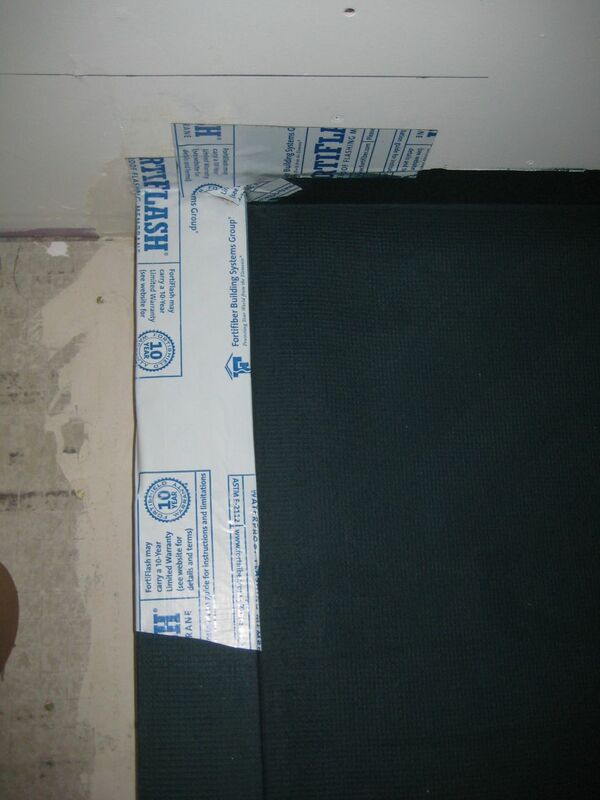 Backer board behind the tile walls – To accommodate grab bars Jim attached plywood backer board to the studs for additional support if grab bars are needed down the road. Light it up – Lighting is critical for a safer bathroom. Jim used 8 lights in the ceiling and ample lighting over the vanity – all of which are on dimmers and can be adjusted for the time of day. Tip 4 – Combine a holistic design with passionate research – A well-known Rolling Stones song says “You can’t always get what you want.” In remodeling this saying may often be true if you’re totally dependent on a contractor to find the products you want for your design. The key to actually getting what you want is the willingness to roll up your “digital sleeves” and do your own digital research (note – from my nationwide wholesale sales experience I’ve seen the most innovative construction products and processes are used because the owner demands them – not because their contractor wants to try out something new). Jim and Debbie wanted their entire bathroom to be coordinated and elegant. 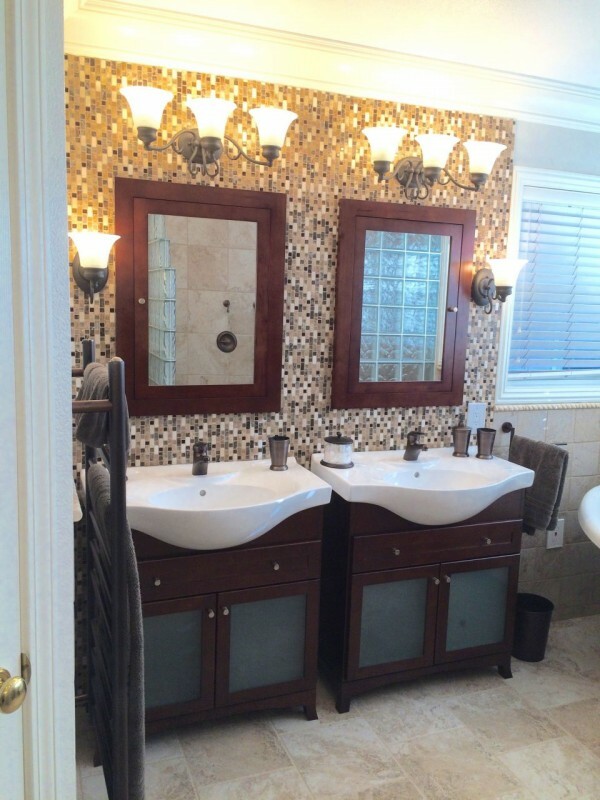 Their goal was to have the oil rubbed bronze vanity fixtures match the shower fixtures. After extensive on-line research they found a line from Signature Hardware to realize this goal. The contemporary vanities and recessed medicine cabinets from Ronbow Manufacturing continue this coordinated and purposeful theme. Lastly the vanity tile wall and decorative stripe in the shower were matched with a pattern called “rocky road imagination” to create a consistent look and feel. Tip 5 – Take the doors off – You can’t think out of the box when you’re enclosed in the box (or in the shower enclosure box). 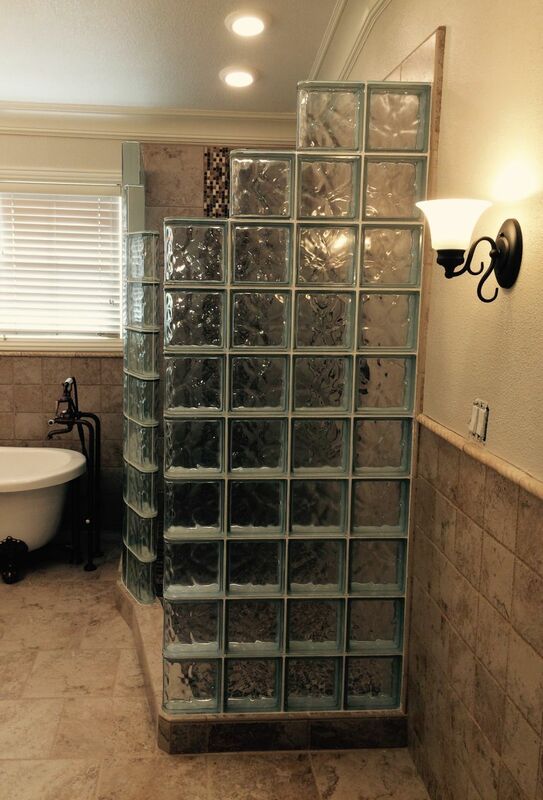 Leveraging the trends in the market today Debbie and Jim decided to go with a doorless glass block shower. This design eliminates the need to clean a shower door and cuts the material cost of buying a door. The curvature of the glass block wall funnels water back towards the drain. Which of these 5 out of the box tips would be best for your bathroom? Comment or call us at the numbers below for additional out of the box remodeling products or ideas. Thats some perfect ten tips for renovating your bathroom. We should always first set our budget and according to it we should plan further. Keeping the available space in mind should also be an important factor because the space should be utilized fully. Between Thanks for sharing these tips ! This will help a lot of people who is looking for renovating their bathroom. I really like your suggestion to take the doors off of your shower when remodeling your bathroom. My husband and I are going to renovate our master bathroom, and we’re looking for improvements we can make that will reduce maintenance and make things feel more open. I think having an open shower would help with both of those things, so maybe it’s a good idea for us. Thanks for your nice comments John! Mike, awesome article. There are many articles available describing how to renovate or remodel small space bathroom or kitchen as compared to Master Bathroom. Actually, I was looking for this type of article from I can get inspiration for remodeling a Master bathroom. I go through many articles but the things you described in your article is quite helpful for anyone who is planning to remodel its bathroom. Wesley – thanks for your nice comments. I’m glad this article helped you. Our company can certainly help you with either a remodeling project or with products for this project. Give us a call. Mike, I love your insight on remodeling a bathroom. I like your thoughts on curves and how they are set apart from traditional boxy look. 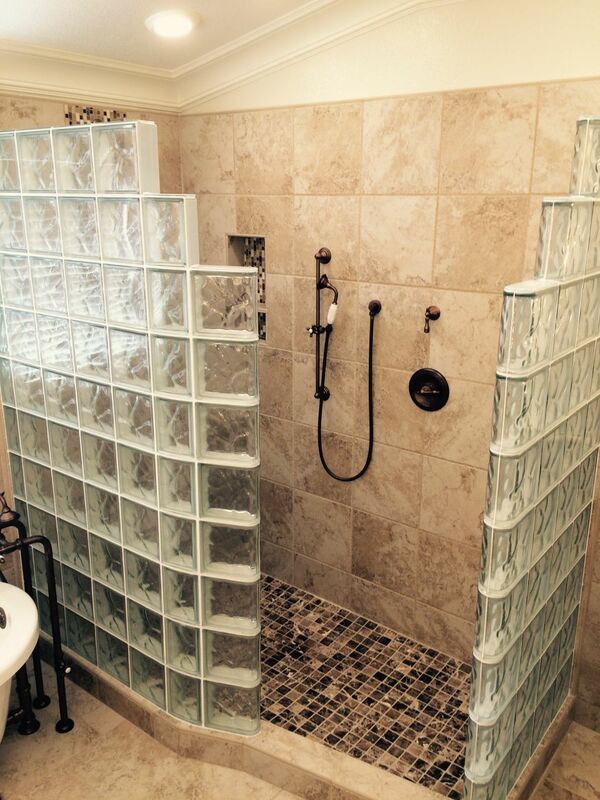 I assume there are contractors that can help remodel a shower room into something brilliant and creative.